We spent over 40 hours researching and testing over 15 different brands and styles of hooded baby towels and found that absorbency, style, and cost were the most important factors for consumers who were shopping for hooded baby towels. Luvable Friends Animal Face Hooded Baby Towel scored high marks in all categories and is our overall top pick. The size of this hooded baby towel is one of the best features it has because it can grow with your baby into toddlerhood and beyond. This absorbent terry cotton towel is soft to the touch and the hood keeps your baby from getting chilled after his or her bath. One of the most popular styles of bath towels for babies and little ones are the cozy hooded bath towel. Although they come in many adorable designs with faces and ears on the hoods, the hood of a baby towel is as functional as it is visually appealing. A baby loses a lot of its body heat through the top of the head. When a baby comes out of the bath, they can quickly become chilled. A hooded baby towel can be placed over the baby’s head while you are using the rest of it to dry their bodies which keeps them warm and cozy. This is especially important during the cooler, winter months. There are many different styles of hooded baby towels on the market to choose from. While there is not a whole lot of difference in function, there can be a lot of differences in absorbency, colors, and sizes. We have taken the three top-rated hooded baby towels on the market according to our extensive testing and research and reviewed them below so you can see their features and specifics. All three of these top-rated hooded bath towels are popular with parents and could be a great solution to your baby towel needs. 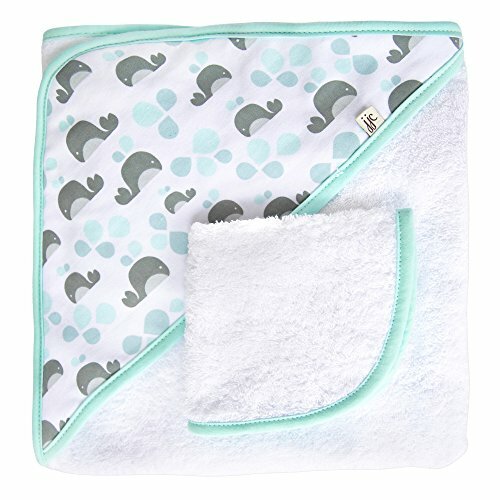 We have also included a buying guide that will describe the different types of hooded baby towels and help you determine what to look for when you are shopping for baby towels. This helpful information will make the whole shopping process much easier and simpler. If you are looking for the perfect hooded baby towel for your little one that will last through the baby months and into the toddler years, this is an excellent towel to consider. It is bigger than many of the other brands of hooded baby towels, measuring 30” x 36” so it will fit your baby into the toddler and preschool years. The soft-to-the-touch terry cotton is warm and absorbent so your baby stays cozy while they are being dried off. There are 20 different fun animals to choose from so you are sure to find your child’s favorite animal among the large selection of choices. Despite being a thinner towel, the Luvable Friends hooded towel will get your baby dry while keeping them warm as well. With the proper care this towel will last but if it is bleached, dried on high heat or otherwise handled roughly it could need to be replaced before the baby reaches a couple of years old. JJ Cole provides parents with this appealing 2 piece hooded towel set that includes a matching watch cloth for washing your baby as well as the hooded towel for keeping them warm and comfortable while they are being dried off afterwards. This hooded towel set comes in a choice of 6 color options so you can find one that matches your baby’s color scheme for the nursery or match the bathroom you bathe them in. The hooded towel and the washcloth are both machine washable and do not require any time-consuming hand washing. The JJ Cole two piece set is made from 100% terry cotton that is super absorbent and soft-to-the-touch. Parents love the cute designs and the fact that neither this hooded towel nor the washcloth will irritate the baby’s sensitive skin. Another plus to this stylish and functional hooded baby towel set is that it does not put off a ton of lint that can get all over their wet skin and be difficult to clean off. This towel measures 30” x 30” which may not be as big as some styles but it is more than large enough for your baby from newborn to the first year. They may like it so much they won’t be willing to give it up when they outgrow it. Last but certainly not least in our list of the three top-rated hooded towels is the Spasilk hooded bath towel that comes with coordinating wash cloths. This is a great choice for budget conscious parents looking for a hooded towel that will fit into their price range. This towel and the included wash cloths are made from a blend of 20% polyester and 80% cotton. They are soft to the touch and hold up great even with repeated washings. They are machine washable for easy cleaning and will last until your baby outgrows using them. These towels measure 30 x 26 inches and although not as large as others, do a great job getting your baby dry after bath. They are on the thinner side so they are not well suited as beach or pool towels. Spasilk hooded baby towel and washcloths come in a choice of three colors and designs. 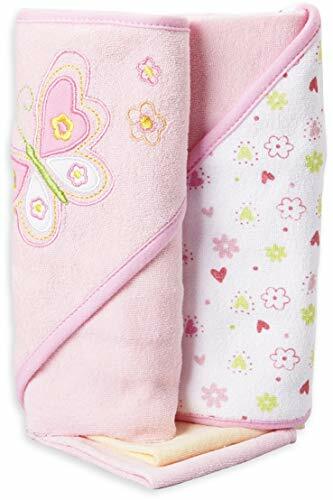 These three top-rated hooded baby towels are the perfect choices for parents looking for quality towels for their little ones. All three have comfy hoods attached that go on the baby’s head after bath so they stay warm while they are being dried off. Each selection is machine washable for easy cleaning and is soft against your baby’s skin. Taking the time to ensure you have purchased quality hooded towels that will last and absorb well will make drying off after bath time even more enjoyable. Babies usually love the cute hoods which provide an easy way to dry their hair without struggling with them. Once you are ready to purchase a hooded towel or two for your baby, considering the top-rated selections we have reviewed above is a great place to start. If you do not see what you are looking for with any of these selections, take a look below at 7 more quality hooded baby towels that you can consider. Why should you purchase hooded towels for your baby? If you already have towels at home you may feel like it is a waste of money to purchase special towels but once you see how convenient and great these hooded towels are you will want to get more than one. Even older kids enjoy the style and design of hooded baby towels. Adult towels and wash cloths can be rough against the skin. You may not notice it, having adult skin but a little baby’s soft, new skin can feel roughness a lot easier and faster and can end up with irritation on their skin. Other reasons to purchase hooded towels include the size. An adult towel is usually large. It is much easier to wrap your baby in a towel that is designed for them. 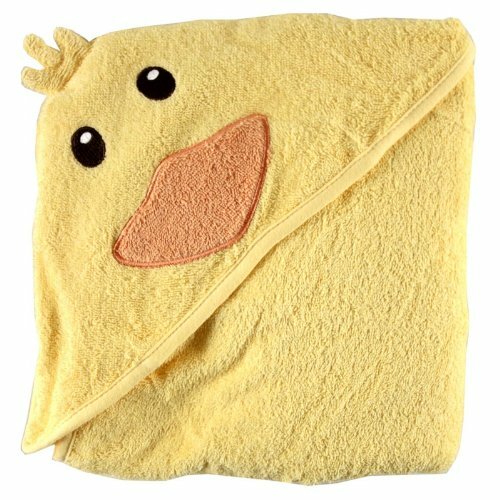 Most hooded baby towels measure around 30” x 30” give or take a few inches which is the perfect size for a baby or toddler. Sometimes babies will have accidents when they are wrapped up in a towel after the bath so using special baby towels is much better than getting your good towels stained. There are several things you will want to look for when you start shopping around for hooded baby towels. We have listed these things below so you are prepared once you start sorting through all the choices you have available. Free of fragrances and perfumes – Many towels have a perfume fragrance that is applied but these chemicals can cause problems for little ones including rashes, other skin irritations, and even breathing problems if they are sensitive to the fragrances. Look for hooded baby towels that are free of perfumes and fragrances for the safest towels for your baby. Made from Premium Materials – Hooded baby towels can be made from cotton, cotton blends, flannel, bamboo, and even nylon. Look for towels that are thicker and more absorbent. Most hooded towels are not going to be as thick as regular adult bath towels but they are plenty absorbent enough to properly dry off your baby. Absorbs water easily – For the best absorbency you will want to look for cotton. Cotton is very absorbent and doesn’t have to be super thick to do so. You want to dry your baby off as quickly as possible after they get out of the bath so they do not catch cold. Durability – No one wants to have to replace their baby’s towels every few months. Look for fabrics that will hold up to frequent washes without the towels pilling. This can make the fabric rough to the touch which the baby will not like very much. Cotton will usually pill a lot due to the shorter fibers. Tightly knit towels will not pill as much so look for tight weaves. Softness – A soft towel will make drying off after bath time an enjoyable experience for the baby. Rough towels can irritate and even scratch your baby’s delicate skin. Hypoallergenic – Because babies have more sensitive skin, it is always beneficial to look for hooded towels that are hypoallergenic. Another benefit to hypoallergenic fabrics is the eco-friendly aspect that they have. Protecting the environment is important to many people so this feature is good for your baby and the earth. Stain resistance – Babies sometimes use the bathroom once they are out of the tub and wrapped in a warm, comfy towel. Cotton and bamboo towels are typically stain resistant so you can safely wash them and not have lingering stains from accidents. Easy to wash – Always look for hooded towels that can be washed in the washing machine and dried in the dryer. Having to hand wash your baby’s towels when they get dirty so easily is very time-consuming. Save yourself extra work and choose towels that do not require any special handling. Variety of colors and prints – Hooded towels are available in a variety of colors, styles, animals and other options. You can choose something elegant and simple such as white with minimal trimming or you can go all out and choose animal designs that have hoods that have faces and ears. Many parents match the bathroom décor or their baby’s nursery. If you are wondering how many hooded towels you need, you will need to think about a few things first including how often you do laundry and how often you give your baby a bath. Washcloths should be used once and then washed. So you will need more wash cloths than you need towels. Ideally, try to get 4 hooded towels and 7 wash clothes if you would prefer to do laundry once a week. You can get by with less if you like to do laundry 2 or 3 times per week. Choosing the best hooded baby towel does not have to be a difficult endeavor. It’s not a serious decision and doesn’t have the same importance that a car seat or crib has but since you use them so often it is still something you should think about when you are setting up the nursery. If the hooded baby towel you choose is soft to the touch, comfortable, and provides your baby with warmth and comfort, they are going to look forward to the times that they can have it wrapped around them. Some babies love these towels so much they end up carrying them around as they get older. The three top-rated hooded bath towels we have featured above are all great examples of the kind of hooded baby towels you want for your little one. All three brands are high quality, offer plenty of room to wrap your baby in, are absorbent, durable, and they are available in a variety of wonderful colors and designs that will please baby and parents. The information you have gotten in the buying guide will help you understand what to look for when you are browsing all the different hooded towels you can choose from. Watch out for chemicals that can cause allergies and opt for the better known brands over no-name styles. This knowledge will enable parents to confidently choose the right hooded towels for their babies and not worry about anything harmful or low quality.